Category Archives for "Online Marketing Software"
Auto Affiliate Machine is said to be a super easy, pushbutton system that you can earn commissions with in the next 47 seconds. But is all this type really true? Or is Auto Affiliate Machine a scam system that is just going to fill you up with hopes and dreams of striking it rich but never make that a reality? If you are thinking about buying into this software you are going to want to reconsider that. Why? Well because it is not nearly as good as it is claimed to be, as you will see in this review. Earning instant commissions in just 47 seconds…? Is this some sort of sick joke or something? I mean this has got to be one of the most ridiculous claims I’ve ever heard, and I’m sure you caught on to it. After all, you are reading this review probably because you are suspicious of this being a scam… And the reason you are probably suspicious is because of the “too good to be true” claims made. A push-button system that you can earn instant commissions with and it can be done in three simple steps… Who wouldn’t want a system like this? I mean look… Even on the sales page they show you it can be done in three super easy steps. All you have to do is buy into the system, activate the software, and to sit back while you enjoy boatloads of autopilot traffic and profits. That’s awesome! Well… Awesome if it were actually true. If this actually worked as good as it is claimed to work then I would be all over it. But of course it doesn’t and personally there is no way I am spending my money on it. You are told that the software creates simple PDF reviews and that you can then make easy money promoting products inside the PDF via affiliate marketing. For those of you who don’t know, affiliate marketing is when you promote products and earn commissions when you help make sales. So the idea here is that you can easily create PDFs with this software and promote whatever products you want inside the PDF document. Makes sense. All they tell you that you have to do is answer a few questions which will help the software customize your PDF and then put your affiliate link in. As you can imagine, you will not get anything nearly as good as you are led to believe. You will get training on how to use the software as well as finding affiliate products that you can promote and of course you will get access to the software itself, which is cloud-based. All the software really does is allows you to create a custom graphic cover for a PDF, add some bullet points alongside it, add bonuses and ratings. It’s not like this software actually creates the PDF document for you or anything like that. There isn’t even any training on creating a high converting sales copy. Also, don’t be full when they tell you that this software will give you free viral traffic. This is very far-fetched and it is unlikely that you will actually get anything to go viral with this. What they say is that this software creates such’s “stunning” PDFs that they are likely to be shared… This is what is meant by “free viral traffic”, but there is certainly no guarantee that you will actually get this to go viral. In fact, my opinion is that it is very unlikely that your PDF will go viral because of this. PDFs or old-school. YouTube is now the second most used search engine in the world and this is because people like videos. They don’t want to have to read a long PDF document. This is just the way the world is evolving and having a PDF go viral just doesn’t seem realistic to me. Before I even started to review this product I pretty much knew what to expect. What am I talking about? Well I am familiar with all three of the creators of this product, which include Billy Darr, David Kirby, and it Justin Opay. I am most familiar with Billy Darr because I have reviewed some of his products in the past. These people usually seem to pump out junk products one after another. They come and go with the seasons. From what I have seen the products that these guys usually get behind are ones that are more focused on making them a quick box rather than really helping out other people make money online. But of course this is all just my opinion. It reminds me of a few other waste of time opportunities that I reviewed recently, like My Home Business Mentors, Amazon Cash Websites, and Kindle Sniper for example. The software is very basic and really doesn’t do all that much, not nearly as much as you are led to believe. And even if it did do is much as you are led to believe, I still do not think it would be worth it. Like I mentioned above, PDFs are just not the way to go when it comes to online marketing nowadays. Sure, they do have their place in the online world and I do not think they are going to disappear, but for viral sharing and getting traffic driven to your affiliate offers from people going crazy over your PDF… I just don’t see it happening. And before you go you might want to check out my number one recommendation for making money online, which is particularly a good way for beginners to get started making money online. This program provides real value and guidance. It’s not just some skimpy product ran together to make a quick buck off people. Click Funnels is a sales funnel software that allows users to easily create conversion focused funnels for any type of business. But is it more than just this? Is Click Funnels a pyramid scheme in one way or another? This is a question I have seen service on the Internet and is something that I want to address, which I will be doing here in this review. In this review I will be giving an overview of what exactly Click Funnels is, who it is for, how it works, the cost, why people are calling it a pyramid scheme, the compensation plan (how people get paid to promote it), and more. If you are concerned about the legitimacy of this entire operation then you are definitely going to want to read this. I haven’t been able to find very good information from others out there on this particular topic. In short, such as I explained above, Click Funnels is a service that allows for easy creation of funnels let convert. The company was founded and is still owned by Russel Brunson, it was well known in the online marketing world and has been very successful with other business ventures besides just this on. Besides Click Funnels he also is in author, as his own supplement company, and is involved in many other things. But anyways… Back to Click Funnels. What is nice about Click Funnels is that it is designed so that anyone can use it, regardless of experience. The software is extremely user-friendly and besides having premade templates for funnels that you can choose from depending on what type of conversions you’re looking for, you also can use the drag-and-drop software to customize it in to make it your own. Whether you are trying to sell a book, capture leads for email marketing, or lure people in with a low price product and then upsell them on a higher price product… Click Funnels allows you to do all of this. You do not have to watch it, but below is a short video, several minutes long, that gives a nice basic overview of everything. There are other similar funnel creation software is out there, such as Lead Pages, but Click Funnels seems to be pretty much the best. Who Is Click Funnels For? So who is Click Funnels best for? Well there are many different people out there who can benefit from this funnel creation software. Network marketers, e-commerce business owners, affiliate marketers, referral marketers, even brick-and-mortar business owners can benefit from a service like this. Ecommerce business owners of course can create enticing and beautifully laid out funnels for promotional products, affiliate marketers can funnel people and send them off to buy the product at another site so that they can earn commissions, and it brick and mortar business owners could use a final creation service like this to capture leads for email marketing purposes. How Does Funnel Page Hosting Work? If you join Click Funnels you will be provided with hosting for your funnel pages. You will not be able to use this software to create funnels on your existing website, if you have one. This may seem like a downside to some people, but there is an upside to this as well. Since CF hosts all your funnel pages everything is more streamlined, meaning that you do not have to worry about updating things on your website or having to deal with technical problems. You get constant updates automatically and there is nothing to install. They host your funnel pages, you are not able to host these pages on your own site if you have one – this might not be desirable for some but at least you don’t have to worry about manual updates the software having problems. And now on to the price… Which unfortunately is going to seem rather high for many people out there. The cost for Click Funnels itself is $97/mo but there are also more expensive options that include training, more pre-made feature, additional tools, and so on. But the $97 per month membership is going to be plenty for the majority of people out there. With this price you get the drag & drop funnel creator, lots of pre-made templates, the A/B split testing feature, and everything I went over so far + more. Ok, so nothing I have said so far really points to this being a pyramid scheme anyway. So why are people calling it a pyramid scheme? Well the reason is because many people out there are using it to recruit others to join and they earn commissions by doing so. And many of these people that are promoting CF are only using the software to promote it, rather than using it for their own unique business venture. On top of this there is somewhat of a pyramid-like commission structure where people can recruit in others, get paid, and also get paid from when those recruits go out and recruit in new members. Russel Brunson was also involved in MLM (multilevel marketing) Companies, such as Pure Leverage back in the day which might be another reason why people are suspicious that this is a pyramid scheme. If you become a member of CF you automatically become a member of the affiliate program as well. Now of course you do not have to promote CF to other people but if you want to the option is there. You can also become an affiliate without actually being a paying member. So if you wanted to promote CF without using the software you could do so. But anyway… Let me explain the compensation plan which is pretty simple and straightforward.. The compensation plan works like this: when you refer someone to join as a member you will earn 40% recurring commissions when they pay their monthly subscription fee. Additionally you will earn 5% commissions from the sales that those people make. This is called a 2-tier commission structure (MOBE also uses this) because you not only get paid from your personal recruits but also from the recruits of those people. CF is not a pyramid scheme at all in my opinion. I can see why people are calling it one because of how you are able to earn commissions from the work of your recruits, but it ends there. There are only 2 tiers… its not some massive multi-level commission structure that pays down 10 levels or anything like that. A simple 2-tiered structure like this does encourage people to recruit and then push those people to recruit, but if legitimate mlm companies are allowed to have many levels of commissions being funneled up to those at the top (for example Visalus uses an 8-tier structure), then Click Funnels should be allowed to operate with a 2-tiered structure with plenty of legal room. In pyramid schemes there will be a large pyramid-like structure, which is why they call them pyramid schemes, that is narrow at the top and branches out the further you go down. The sort of schemes are focused on recruitment, in which commissions are made. These commissions trickle up the pyramid structure from the bottom to the top, taking away from those of the bottom and benefiting those at the top. In addition to their pyramid -like structure, pyramid schemes also put the majority of their focus on recruitment rather than product sales to the general public, which CF really doesn’t seem to do all that much. They give you the option to recruit in members and earn money doing so, and you can use their funnel creation software to do this, but this just does not make them a pyramid scheme.. Plain and simple. Yes, people do get paid when they promote Click Funnels, and many people promoting are probably using the software just to promote it, and not for their own business venture, but this is just the way it is. It does not make a pyramid scheme though. Final Thoughts – Is It Worth The Price? Whether or not Click Funnels is worth paying for really depends on your situation. There are many people out there that could benefit greatly from easy to use funnel creation software like this, but for others it might be too expensive. If you’re dead set on purchasing some sort of funnel creation software, then CF is probably what I would recommend above others. Like I said there are other very similar funnel creation services out there, such as Lead Pages, but CF ranks at the top in my book. You can do more research if you want to comparing this to others, but from what I have seen most other people seem to like Click Funnels the best too. A nicely laid out conversion focused funnel can have a massive positive impact on businesses if they aren’t already using a funnel, and Click Funnels makes it super easy to create these beautiful funnels… It’s as simple as that. And it’s also worth noting that they do provide good support, have a good reputation, and even provide some free training to help you get your first funnel up and running. TCP Lifestyle System – Scam or Great Opportunity to Make Money Online? The presentation for TCP Lifestyle System makes it seem like one heck of an amazing opportunity for making money online…. but is it really? Is this as good as it seems? Or is TCP Lifestyle System a scam that is just going to leave you with less money at the end of the day? There has been a lot of hype around this program so I decided to do a little digging around and find out what its all about. The promo video that I watched for TCP Lifestyle System didn’t really tell you much or give the full picture of what is going on here so in this review I’ll be going over it all. I’ll be going over what exactly this place is, what it provides, how you make money and more. If you are suspicious of this program this is normal. The video presentation I watched made me very suspicious as well. In the video they talked all about the money they have helped people make and how amazing it was. I review scams all the time on this site so when I see a sales pitch like this that is over-the-top my little scam sensors start to warn me. The TCP Lifestyle System promo video flashed pictures of sports cars, talked about being able to quit your job and live in your dream home, etc. Systems like this that are promoted by talking about all the money you can make above all else usually have something to hide. So what exactly is TCP Lifestyle System? TCP Lifestyle System is a sales funnel for TCP, or The Conversion Pros. Its a website that was set up by a member of The Conversion Pros to get people to buy into it. TCP is one of those systems that people buy into to make money online and then end up making money online by getting other people to buy into it. In this way it is very similar to to programs like MOBE, Aspire, Jeff’s 6 Figure Business system, etc. When you buy in you are then provided with a suite of tools as well as training so that you can market the same opportunity to other people. And when you get other people to buy in like you just did, then you will get paid commissions. This is exactly what the creator of the TCP Lifestyle System is doing. When you buy in you will get what you saw when you bought in (or almost bought in). You will get the sales funnel with the presentation video that you watched and all of that. You will also get a digital marketing products like an autoresponder so that you can blast out emails to try to get people to join, you will get access to a capture page creator (used to get people to give you their emails), training and a lot more. The product to make money is already in place. You are going to be making money by selling the TCP Lifestyle System to other people if buy in. The job you have to do is market it. They give you tools to help with this but there is still much work to be done. Traffic generation is no easy task. You might be wondering how you can possibly make any money if the system is free. After all, this is what they tell you in the video presentation and if you are just giving away free systems then there is no money to be made. When you sell this system to other people you will get 50% commissions. So since the membership is $50 you will make $25 of that. You will make this 50% commissions every month that your referrals remain paying customers since this is a membership site and you have to pay on a monthly basis. This is what they are talking about in the promo video when they mention residual income. This is not a mlm where there are multiple tiers and you can get paid by the referrals that your referrals make and so on. You only get paid from your direct referrals. When it comes to actually getting paid you get your money at the end of every week. One thing that I like about this is that they are straightforward and pretty much tell you that you will be selling the system to make money. They don’t beat around the bush and make you buy in thinking that you will be making money in a more legitimate way. You should at least have an idea that you will just be selling the same system to other people beforehand. Now I don’t really care for systems that work like this where you just go out and make money selling the same system and the cycle continues, however its better than many other similar programs that mislead you more. Other than that I will say that this program does seem to provide a lot of tools and good training. I haven’t went through the training myself and put everything to the test but I have been involved with online marketing since 2015 and make a living with it, so I know what has the potential to work and what doesn’t. Conclusion on TCP Lifestyle System – Good Opportunity? 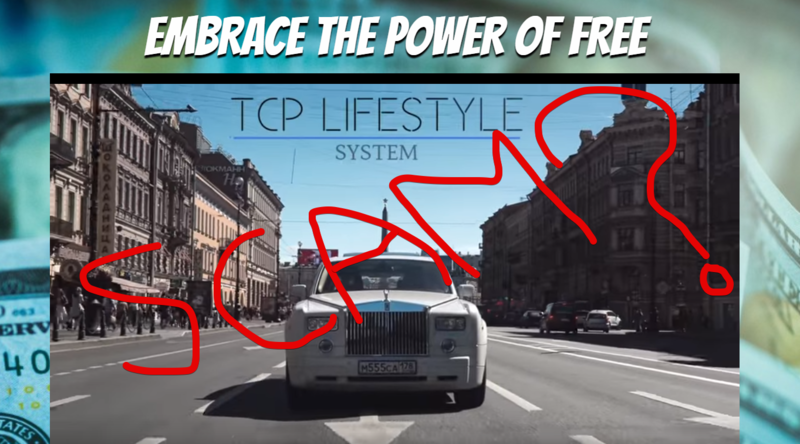 The TCP Lifestyle System is not a scam. They do provide good tools + training and people really can make money with this. However, I don’t really care for systems like this where people just make money by selling other people on the hopes and dreams of making money online. Its just a cycle of getting other people to join and then they get others to join and its endless. If you are going to join just know what you are getting yourself into. I hope you found this review helpful and insightful. Another program that I would definitely suggest checking out, which I am a member of is called Wealthy Affiliate. I joined back in 2015 when I got started online and have been a member ever since. What they provided not has me making a living online which was always the goal. You can read my review of Wealthy Affiliate here to learn more. If you are getting into online marketing then having an autoresponder is something that you definitely need to look into. Aweber is one of the choices out there but are they any good? Or is Aweber a scam somehow that is just going to leave you discouraged and frustrated at the end of the day? In this review I’ll be going over all you need to know about Aweber before you make a decisions of whether or not to use it. I’ll be going over how it works and even talking about my personal experience with it. Aweber is one of the most popular and trusted autoresponders out there. And no… it is not a scam. I have been using it since 2015 so I can say this from experience. What an autoresponder is for those who are new to this all, is a software that allows you to send out automated emails to people who sign up to your email list. It saves a bunch of time and anyone who runs a business online or any kind can be benefiting from one. So lets say you have a cooking blog or something like this. You could use Aweber to get people to sign up for a weekly newsletter or something of this nature and send them out a recipe every week. Or if you run an ecommerce store you could send people a weekly email with the best deals going on. There are a million possibilities of what you could do here. There is a saying that goes “its all in the list”, meaning all the potential is in the email list. And while not all the potential is in the list there is a heck of a lot in it. Just think about it. If you capture people’s emails who visit your site you are then able to contact them any time to get them to come back, whereas with other traffic generation methods (SEO, paid advertising, etc) it takes a lot of work. So while initially it can be difficult to get visitors to your site and capture their emails, once you have them the traffic that comes from that email list is as easy as it can possibly get. I’m not going to go over every part of Aweber but I will go over a few things that make it effective, the first being the follow up series you can create. When someone signs up to your email list you can create a series of automated messages that go out at any time you want them to. You can set up a series of messages that will go out over months if you really want to of you can just set up a couple, it doesn’t matter. You can also send out messages to your entire list at any time you want to. Maybe you have something that you just have to tell them for one reason or another. You could have an email list of 10k plus people and this will allow you to send an email out to all of them instantly. Aweber also gives you stats on your emails, such as open rate, spam score, etc. This is very helpful because if you an email you send out gets a very low open rate then you know the title is no good. So you can play around with this to get better open rates in the future. The stats show you what is and what is not working. Aweber can cost anywhere from $19 a month to $149 a month depending on how many subscribers you have. The pricing may seem like a lot but its really not if you compare it to other autoresponders. And besides it is worth the price. Well it might not be in the very beginning when you have very few subscribers, but as you grow your list it will be. When I started using Aweber it made a huge difference. I started out offering a free course for affiliate marketing which I set up to go out automatically with the follow up series. Now, I don’t do this anymore, but it made me a lot of subscribers, many of which are still here with me today. Email marketing with Aweber really changed things up for me and helped me get to that next level of online marketing. Conclusion on Aweber -Worth It? Aweber is definitely one of the better autoresponders out there. It is worth it for sure but it might not be right in the beginning. Its one of those things you have to invest in and have faith. As long as you are able to grow your list then it will pay off big time. Also, if you are running an ecommerce store, like Shopify, you might want to look into other autoresponders that are more for this kind of online business. Aweber will work but its more of a general use autoresponder.